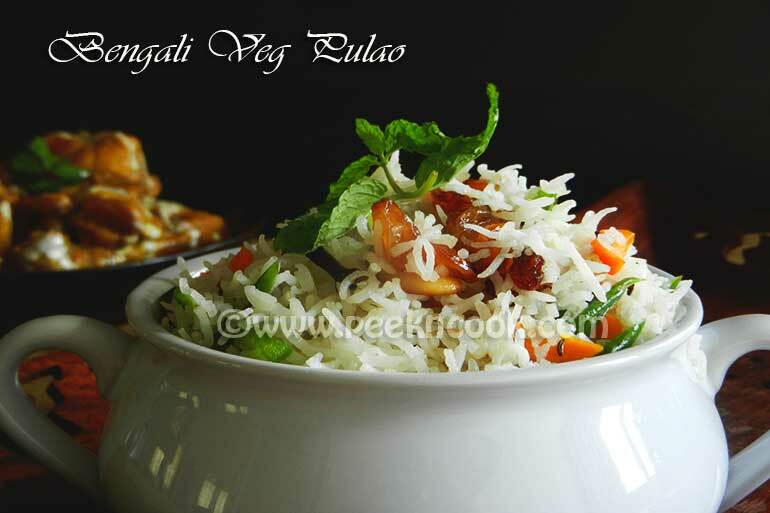 Bengali Rice Polao/Pulao/Pilaf is sweeter on the side. Bengali Pulao is cooked with Gobindobhog Rice (Special arometic rice, which is only available in West Bengal), ghee & other vegetables. Take a large sauce-pan and boil 5 cups water in it. When the water will start boiling, add the rice and cooked till 80% rice is cooked. Strain the rice and spread onto 2 dinner plates. or on a large serving tray. Now heat the ghee in a large pan, add the chopped Cashew & Raisins and fry for few seconds and take them out of the pan. In the same pan add the cinnamon, cloves, cardamom pods & bay leaf and fry till the fragrance comes from the whole spices. When the aroma will come add the chopped vegetables to the pan, add some salt and fry till the vegetables become tender. When they are tender and soft add enough, fried cashew, fried raisins, salt & sugar and mix with the cooked veggies. Now add the cooked rice and gently mix with the veggies, the cooked rice should not be broken. Check if any salt & sugar is required. Pour into a large serving bowl and serve hot. This rice can be cooked in another way into the Pressure Cooker. For this process you do not need the pre-cooked the rice. Heat the ghee in a pressure cooker, add the cinnamon, cloves, cardamom pods & bay leaf and fry till fragrance comes. Add the chopped veggies, cashew nuts, raisins to the cooker and add some salt and fry till the veggies are cooked. When they are tender add the soaked but strained rice and lightly fry to mix all together. Add salt & sugar and 1 1/2 cup of water to the pressure cooker, check the salt & sugar. Cook the polao upto 1 whistle on high heat. After 1 whistle turn off the heat and keep the cooker aside for another 15 minutes. After 15 minutes open the cooker and your Ghee Bhat will be ready to serve.